We are a prominent Tour and Travel Company that is actively providing incomparable Hotel Booking Services all over the world. We have a strong foothold in booking your rooms with hotels like 5 star, 4 star, 3 star, 2 star or Resorts. 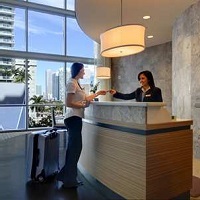 Our team of adroit professionals keep a check on the facilities like Laundry, pick& drop, Restaurant/bar/conference etc. and amenities like Power backup/internet/DTH/room services etc. and only then book the room. Moreover, all sorts of rooms like A/C Room, Non-A/C Room/Deluxe Room etc. are offered by us.